It all started with William-Sonoma. I remember wandering around the crazy home cook’s wonderland and wondering “do people really need paella pans?” I admit, I was intrigued. In my adult life, kitchen supplies give me the weird shopping rush that shopping for school supplies used to give me. 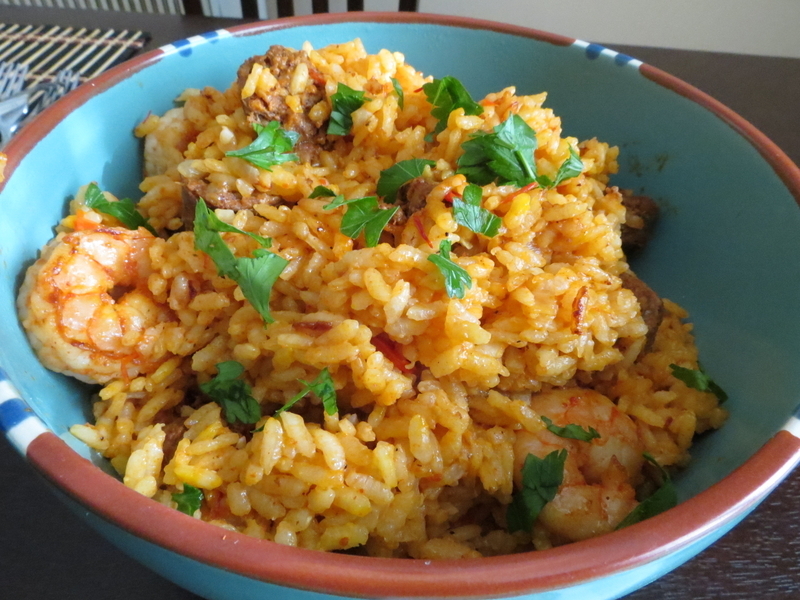 So without thinking much of it, I pushed my experimentation of making paella to the back of my mind– thinking that I needed this special giant pan to make this delectable Spanish dish. That was, until I stumbled upon a couple of Dutch oven paella recipes; thus shattering my Williams-Sonoma-induced curse. A trip to my favorite spice shop in Silverlake helped get the gears in motion. I don’t usually gravitate towards pre-made seasonings, but when it is from a selection of high-quality spices like what is available at Spice Station, I make the exception. A friend of mine were out on a lunch date and dropped in to pick up some pantry items when I saw their Valencia Paella seasoning. Loaded with just the right amount of traditional spices and saffron, this seasoning was a steal at less than $4 an ounce; and better yet, a little goes a long way. A quick trip to the farmers market and my local specialty food store and I was all set to make a hearty paella that is simple and satisfying. What you need: Dutch Oven, wooden spoon, microplane zester, and measuring cup. 1. Toss shrimp, 1/4 teaspoon salt, 1/4 teaspoon black pepper, 1 tablespoon oil, and 1 teaspoon garlic in medium bowl; cover with plastic wrap and refrigerate until needed. 2. Add oil to Dutch oven over medium-high heat and sautee onions and garlic until transluscent (about 2 minutes). Add diced bell peppers and cook an additional minute before adding tomatoes. Crush tomatoes with wooden spoon. 3. Slowly add rice to pot, stirring constantly to incorporate it into tomato-onion mixture. Let oil coat rice for a few seconds before you add broth, wine, and bay leaf and bring to a boil. 4. Reduce heat to low and keep at a simmer until rice is tender and liquid is absorbed (about 25-30 minutes). Keep extra broth on hand in case you need it. Take wooden spoon and stir rice every few minutes. To achieve soccarat, allow rice to crispen slightly on bottom of pan, making sure not to burn for a crisp carmelized result. 5. When there is little liquid left in pot, tuck shrimp under rice and add chorizo. Cook until shrimp are white and opaque; you may add an ounce or two of water or broth just in case shrimp isn’t cooked through. Add green peas. 6. Once shrimp is cooked and liquid has evaporated, toss paella lightly in pot to scrape the developed socarrat off the bottom. Place in serving dish and top with fresh parsley and lemon zest to garnish with lemon wedges on the side. Looks great! I’ve been wanting to try and make Paella. I bought the big pan but have not made it yet. This recipe might be my first attempt! I enjoy going to William Sonoma and looking at all their cooking gagets too. Thanks for sharing your recipe. This recipe is very simple, but if you’ve got some boneless skinless chicken thighs (diced) or some fresh mussels available, definitely add those in for a heartier paella.